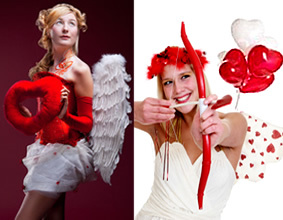 2019 Romantic & Fun Valentines Entertainment and Singing Telegrams in Connecticut, New Jersey & New York. If you intertested in booking Valentines Day Entertainment for your home, church, business, school, store, mall, venue, children's party, special proposal day, please Email us or call us Today! (203) 461-3357 or (203) 322-4516. 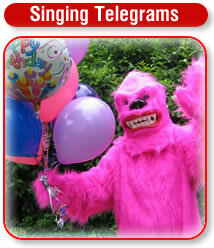 We've been serving the Tri-State areas of Connecticut, New York & New Jersey since 1986 and have the best valentine party entertainment options including reserving a singing telegram to surprise your loved one. 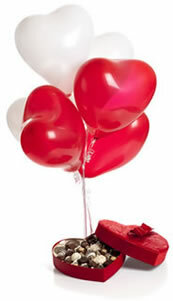 Get a Valentines Event Consultation! 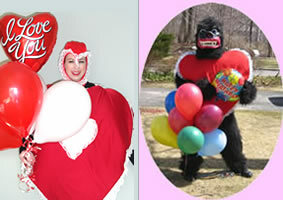 Surprise your sweetheart, friend, Co worker or family member with a silly, fun & romantic Valentine Costumed Characters. 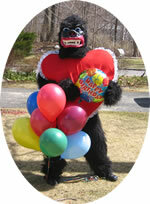 Choose from the all time favorite Sweetheart Gorilla, pink or black or Sweetheart Chicken or Sweet hearted Girl in a heart as well as Cupid, Pig with Heart, Man in a Tux, Character Actors, Hawaaiian Dancers, Belly Dancers and more! Our phone o grams are also a fun great choice and extremely affordable for all. We call your special Valentine anywhere Nationwide and sing a special song, deliver any special message and generally give the recipient a laugh while letting them know how much you care. Caricature Telegram Gifts! Contact us for information. 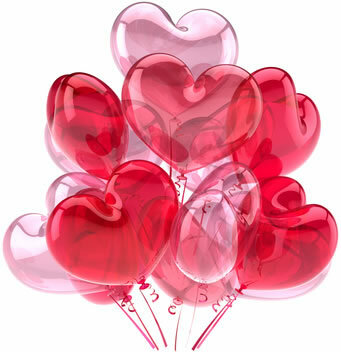 All of our Singing Telegrams including a colorful, beautiful Valentine Balloon Bouquet or Flowers Bouquet to make her or him feel very special and loved. 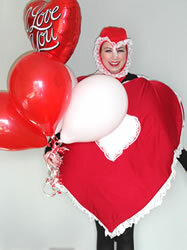 For Valentines day you might like to surprise and embarrass your loved one at work. We are starting our Valentines day specials for the entire week leading up to Feb. 14th. Whether choosing one of our Character Valentines Singing Telegrams or Phone O Grams, or telegrams, there is always something special we can do for you on Valentines day to surprise and delight your special loved one. 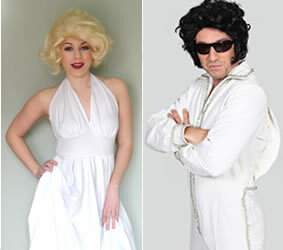 Let's Have a Party will energize your special Valentines Day Entertainment. Our sheer fun is at your service! The staff of Let's Have a Party brings to our clients the very finest in professional entertainment and party planning services. 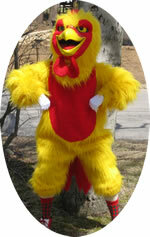 Contact Us Today to book your Clown or Party Entertainment in CT, NJ and NYC. Costumed Characters, Santa & Elves, Princesses, Super Hero's Hawiian, Belly Dancers, Caricature Artists, Balloon Sculpture Artists, Face Painters, Casino and Murder Mystery Parties, Inflatables, Rides & Games and Pony & Petting Zoo. © 2018, I Luv a Party, Inc.